From the outside, an apartment complex could be seen as a housing option where it’s what’s inside of the room that really counts. For those who reside there, the overall package is as important as ceilings that don’t leak and walls that cancel out your neighbor’s noise. The thing is, apartment buildings are more than just tenant concerns and landlords trying to address service requests; these sprawling footprints can either be an eyesore or point of pride for a community. Anton Kalafati of B Side Construction can tell you all about the differences. That’s because Mr. Kalafati has spent more than a decade in the commercial and apartment renovation industry and has completed eye-pleasing projects for local clients and housing authorities that undertook exterior upgrades to dated appearances. According to 2017 statistics from the National Multifamily Housing Council and the National Apartment Association, renting has grown into a popular option for millions of Americans following the economic downturn of 2009 and beyond. Driven by immigration and out of economic necessity, “we need 1.4 million housing units per year just to replace the lost housing units. The type of housing needed in the future is also shifting towards units that accommodate older households,” the study states. This clearly shows that renting isn’t going away any time soon and homeownership, according to the study, continues to be delayed due to lower income and student loan debt incurred by millennials. With the rise of apartment housing now established, Anton Kalafati of B Side Construction states that it would be of great benefit for owners of these complexes to invest the resources to keep them current. That’s where Mr. Kalafati’s skills and previous projects that are part of his portfolio would come in handy. When doing past work for the Alameda Housing Authority, Anton Kalafati and his B Side Construction crew completed siding and window replacement work at the complex that’s just below uptown Oakland. 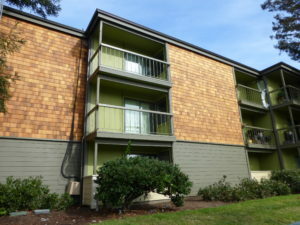 Photos of the work show a modern wooden paneling as the siding and muted green and tan tones on the exterior. This type of contemporary industry knowledge is what Mr. Kalafati can bring to the construction site should a property manager want to reinvigorate appearances and, most likely, drive additional tenants to the apartment complex. There’s no question that renting apartment building units will remain a popular housing option for years to come. As such, it would behoove the owners of these facilities to keep with the times and make sure that their units are visually appealing to possible residents.